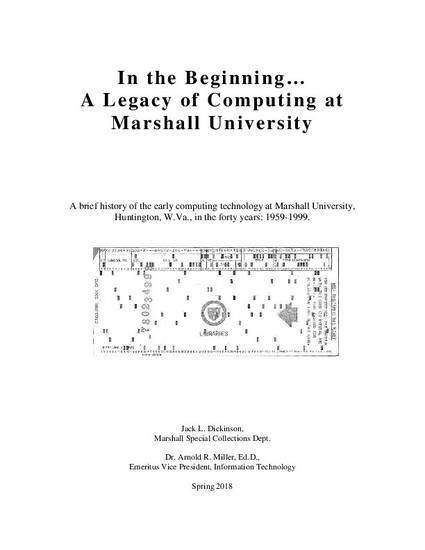 This book provides a brief history of the early computing technology at Marshall University, Huntington, W.Va., in the forty years: 1959-1999. This was before the move to Intel and Windows based servers. After installation of an IBM Accounting Machine in 1959, which arguably does not fit the modern definition of a computer, the first true computer arrived in 1963 and was installed in a room below the Registrar’s office. For the next twenty years several departments ordered their own midrange standalone systems to fit their individual departmental requirements. These represented different platforms from different vendors, and were not connected to each other. At the same time, the Marshall Computer Center developed an interconnected, multi-processor environment. With the software problems of year 2000, and the I/T move to the new Drinko Library, several systems were scrapped. New systems were installed on the pc server platforms. This book includes images of the various systems, several comments from users, and hardware and software descriptions. Dickinson, Jack L., and Arnold R. Miller. In the Beginning…A Legacy of Computing at Marshall University : A brief history of the early computing technology at Marshall University, Huntington, W.Va., in the forty years: 1959-1999. Huntington, Marshall University Libraries, 2018.